MarcoPolo – is our new and fresh WordPress theme which is perfectly enhanced for food, restaurant, dining room, canteen and any other similar place. 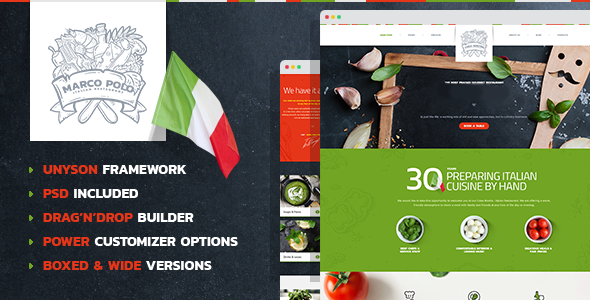 This theme includes everything necessary for any kind of eating house: presentable homepage, detailed menu, chef info, calendar and appointments, gallery etc. The Customizer in theme is very handy, also you may improve and modify the appearance of your pages with Unyson Drag & Drop Page Builder. The theme familiar with Bootstrap 3 and has clean optimized code. As the bonus our theme includes carefully layered .PSD files Also detailed documentation with screenshots will help you to customize your theme easily. Our theme is backed up by our friendly and effective support team. If you have any questions please get in touch with us at our support forum!